We are proud to showcase the five winners of our tenth annual Facilities of the Year Competition. These facilities represent a wide variety of industrial sectors and geographical locations. Despite their diversity, however, they all share the trait of being leaders. The dedicated environmental staff at these facilities demonstrate every day their leadership skills by showing their strong beliefs in the importance of protecting the environment, articulating and acting on those beliefs, and being held accountable for the results. We all need to learn from these leaders and become leaders ourselves. Journal Sentinel Printing Plant -- Milwaukee, Wis. The Journal Sentinel Printing Plant was built in 2002 on the largest reclaimed brownfield in Wisconsin. The 41-acre site of a former foundry, which manufactured steel tubing, underwent a $7.75 million cleanup to remove polychlorinated biphenyls from the soil prior to the building of the new printing facility. At the new location, the plant management installed new state-of-the-art coldest offset printing presses. As a result of the low level of volatile organic compound emissions from the non-hazardous inks and solvents used on the presses, the facility is not required by the Wisconsin Department of Natural Resources to have an air operating permit and is also classified as a non-generator of hazardous waste. In addition, the printing plant has installed an innovative type of lighting that reduces electrical consumption by more than 40 percent compared to traditional lighting technology. As a result of these actions, in 2003 and 2004 the printing plant received the following recognition: the Governor's Award for Environmental Excellence, the Wisconsin Clean Air Partners Award, the Federation of Environmental Technologies Award, and the Wisconsin Manufacturers and Commerce Award. IBM Corp. -- Essex Junction, Vt. 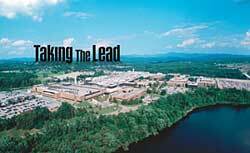 The IBM facility in Essex Junction, Vt., designs and manufactures advanced semiconductor microprocessors for a wide range of electronic devices. The facility has an onsite wastewater treatment facility that processes organic and inorganic manufacturing and site wastewaters. The facility personnel are proactive in optimizing chemical usage and minimizing waste generation. For example, in 2003 the facility upgraded its infrastructure with microfiltration technology to treat the chemical/mechanical polish wastewater stream. The new system has achieved more than 97 percent average removal of key discharge parameters such as copper and iron. The facility has received at least one award for environmental excellence every year since 1993 from the Vermont Agency of Natural resources. And the U.S. Environmental Protection Agency (EPA) Region 1 office gave the IBM plant a merit award for sustained environmental performance in 2001 and another merit award in 2003 for being a National Environmental Performance Track participant, which is a program that recognizes superior environmental performers. Smithfield Transportation Company, a part of the Smithfield Foods Company, has two facilities based in Smithfield, Va. and Tar Heel, NC. Smithfield Transportation services a number of Smithfield meat packing plants. Both of the transportation facilities, which achieved certification in 2004, have implemented environmental management systems modeled after the ISO 14001. The two facilities are members of the Smartway Transportation Partnership with EPA, which is a voluntary program that allows transporters to share information and help implement new technologies designed to prevent pollution and conserve energy, such as auxiliary power units used in idling trucks to reduce fuel consumption. Since joining, Smithfield Transportation is piloting singlewide tires designed to improve fuel economy and stability. As well, it has piloted a fuel additive to help cut air pollution emissions and improve fuel efficiency. The two facilities have been active members of Businesses for the Bay, World Water Monitoring Day, and the Virginia Environmental Excellence Program. Additionally, in 2005 Smithfield Transportation received an award from the American Meat Institute for environmental stewardship. Epson Portland Inc. -- Hillsboro, Ore.
Epson Portland Inc. (EPI) manufactures products, such as ink cartridges, for its Japanese parent corporation, Seiko Epson. The company has actively pursued environmental improvements to its business practices since the early 1990s. For example, the company eliminated the use of all chlorofluorocarbons (CFCs) from its production process by 1993, and then in 1997 it won a Stratospheric Ozone Protection Award presented by EPA. In 1998, the company received certification of its environmental management system under ISO 14001. In 2000 it became the fist charter member of EPA's National Performance Track. In 2001 EPA won the Recycler of the Year award from the Association of Oregon Recyclers and the Green Environmental Management System Achiever Permit from the Oregon Department of Environmental Quality. Additionally, in 2003 EPA became a patron-level participant in Portland General Electric's "Clean Wind" program, which means that 10 percent of its energy needs are supplied by wind-generated sources. As a result of EPI's participation in the Clean Wind program, EPA recognized it as a "Green Power Partner" in 2003 and 2004. Safety Kleen is the largest parts cleaner, industrial waste management, and used oil re-refining and recycling company in North America. In 2004 it collected more than 200 million gallons of oil and re-refined more than 140 million gallons of oil, and it also collected and reclaimed more than 330 million gallons of waste. In 2003, British Petroleum (BP), the environmentally progressive international energy supplier presented Safety Kleen with an award recognizing the quality of the company's environmental management system. More than 6,300 companies have been reviewed to date by BP, and only 111 have met the requirements to be vendors of the British energy corporation. In 2005, Safety Kleen became the first cleaning and environmental services company to achieve ISO 14001:2004 certification on a national scale, with all of its 150 facilities becoming certified. Additionally, this year EPA recognized the company for the environmental leadership it showed in relation to EPA's Resource Conservation and Recovery Act (RCRA) Corrective Action Program. Do you anticipate that your facility will be formally recognized in 2006 for pollution-prevention strategies, innovative design, or other environmental accomplishments? If so, please let us know and we'll consider it for the title of one of our 2006 Facilities of the Year, which will be featured in our magazine's September 2006 issue. Every year we single out the top U.S. industrial plants, water and wastewater treatment operations, landfills, or other facilities that have been recognized for outstanding environmental achievements by governmental regulators, trade associations, or other professional groups. The deadline for submissions is July 1, 2006. If you are interested, please contact Angela Neville, editor-in-chief, at aneville@stevenspublishing.com or (972) 687-6721. Atmos Energy, Franklin, Tenn., was honored with the 2005 Environmental Excellence in New Technology Award from the Southern Gas Association for using open-path Fourier transform infrared spectroscopy to monitor air quality during the remediation of a former manufactured gas plant site. Bausch & Lomb, St. Louis, Mo., received an Honorable Mention from EPA Region 7 in connection with the agency's Pollution Prevention Award for the facility's hazardous waste reduction project, which resulted in the plant being reclassified as a small quantity generator. The Commander, Navy Region Mid-Atlantic, Virginia Beach, Va., in April 2005 won the U.S. Department of Defense Environmental Quality Award and was recognized for its Regional Pollution Prevention Program for the success it has had in greatly reducing releases of toxic chemicals and off-site shipments of hazardous waste. Delta Airlines, Atlanta, Ga., received during 2003 and 2004 a total of four gold awards from the Georgia Water & Pollution Control Association (now known as the Georgia Association of Water Professionals) for its exemplary National Pollutant Discharge and Elimination System (NPDES) permit compliance record. Hewlett Packard, Boise, Idaho, was awarded the 2005 Environmental Excellence Award by the Idaho Association of Commerce and Industry and was also recently inducted into EPA's National Environmental Performance Track Program. The Iowa Army Ammunition Plant, operated by American Ordnance LLC, Middletown, Iowa, was honored by EPA Region 7 in 2002 and 2005 with the Pollution Prevention Environmental Excellence Awards for its fly-ash recycling program and its design of a new state of the art paint system that reduces waste. Panasonic Shikoku Electronics Corp. of America, Vancouver, Wash., received the 2004 Environmental Stewardship of the Year award from the Port of Vancouver for the facility's environmental efforts related to the recycling of materials, the reduction of waste streams, and the cutting of energy consumption.